Abraham Lincoln is always first in those surveys of Presidential historians ranking the holders of the office. I've just found a couple of essays about Lincoln as literary figure. They are both by Douglas L. Wilson from the Lincoln Studies Center at Knox College in Galesburg, Illinois. The first, "Lincoln the Persuader," is about Lincoln as a writer. Wilson tells us that "[H]is private secretaries Nicolay and John Hay declared emphatically in their joint biography of Lincoln, 'Nothing would have more amazed him while he lived than to hear himself called a man of letters.'" and that "The truth is that Lincoln’s writing, while frequently noted for its clarity, did not rate high by the prevailing standards of eloquence, which, like the architecture of the day, valued artifice and ornament." Standards soon changed. He was a very deliberate writer, anything but rapid. I cannot remember any peculiarity about his posture; he wrote sitting at a table and, as I remember, in an ordinary posture. As to dictation, I never saw him dictate to anyone, and it certainly was not his practice to do so. He seemed to think nothing of the labor of writing personally and was accustomed to make many scraps of notes and memoranda. In writing a careful letter, he first wrote it himself, then corrected it, and then rewrote the corrected version himself. 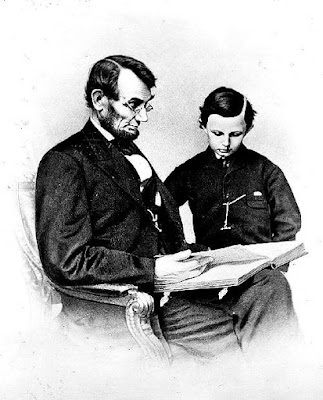 Lincoln had very little formal education but he read whatever he could get. He appears to have been very familiar with the King James Version of the Bible. He also read and memorized Shakespeare. The second of Wilson's essays, His Hour Upon the Stage," describes his love of several of the plays [he loved to recite and read aloud from them] and shows why he preferred reading them to the manner they were then performed on stage. On August 17, 1863...Lincoln wrote an often-quoted letter to Hackett that remains the centerpiece of our knowledge of Lincoln’s devotion to Shakespeare. Arguably the most forthcoming of his personal letters, it may also be the least appreciated.